Is Marijuana the Next Big Antibiotic? Studies have shown that compounds in cannabis effectively kill current antibiotic-resistant superbugs like MRSA. When it comes to marijuana legalization, we should be talking more about antibiotics. Studies have shown that compounds in cannabis effectively kill current antibiotic-resistant superbugs like MRSA. The majority of the arguments surrounding marijuana legalization focus on psychoactive THC. In general, anti-marijuana activists don’t want to legalize yet another mind-altering substance. But, focusing the legalization conversation on THC alone ignores perhaps one of the most important qualities of the cannabis plant: its antibiotic and antiseptic properties. Only two new class of antibiotics have been introduced in the past 30 years. This fact is quite scary, especially considering that we developed 20 new classes between 1940 and 1962. Bacteria and microbes evolve at a much faster rate than we’re able to intelligently prevent them. As far as antibiotics go, it’s us versus nature and nature is winning. An antibiotic is a tool that we can use to kill off the majority of harmful bacteria in any given body or space. Where we get into trouble is with the remaining bacteria that survived. These bacteria are the strongest of the bunch, and they continue to multiply with their antibiotic resistant genes. We’ve been abusing antibiotics for quite some time. Antibiotic resistance really began shortly after we first started mass-producing them. 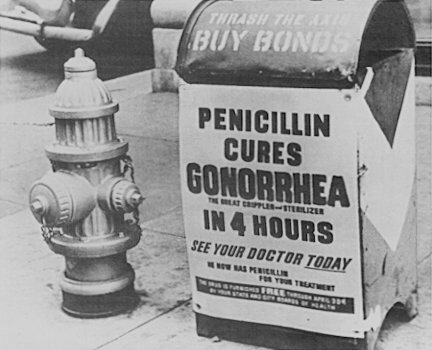 In a famous example, a round of penicillin was preemptively dispatched to prostitutes near army bases in Vietnam in order to prevent soldiers from getting gonorrhea. Shortly after, a new strain of penicillin-resistant gonorrhea popped up. Gonnorhea is now resistant to many different antibiotics. This has been extremely concerning for the U.S. Center for Disease Control, which has issued several laboratory recommendations to halt the progression of resistance. Back in 1935, cannabis tablets were used to treat gonorrhea. But, the 1937 Marihuana Tax Act put and end to the medical distribution of cannabis in the US. The era also lacked the scientific means to extract and test the individual antibiotic properties of the herb. This meant that cannabis was not isolated as an effective cure, but rather a way to mitigate some of the symptoms. No studies have come out recently that test the efficacy of specific cannabinoids against gonorrhea using modern technology. But, compounds found in weed have been found to kill off some of the most major superbugs of our time. Methicillin-resistant Staphylococcus aureus (MRSA) is an extremely painful type of staph infection that is difficult to treat. Some strains of MRSA are even immune to Vancomycin, the strongest antibiotic that we have as a human species. Vancomycin is only used as a drug of last resort. MRSA can lead to a very serious systemic bacterial infection if it makes it into an open wound. This is an infection that can lead to permanent disability if not cleared. We’re talking years of physical therapy, excruciating long-term stays in the hospital, and even death in those with weakened immune systems. In their research, study authors Giovanni Appendino these and Simon Gibbons found something amazing. These cannabinoids are as effective as Vancomycin when it comes to killing MRSA. They also do so in a different way than what we commonly expect from antibiotics, making them especially meaningful when it comes to treating microbial infections. The Appendino/ Gibbons study also hinted that marijuana compounds could be a potential cure for multi-drug resistant tuberculosis as well. Though, more research is needed to test just how potent cannabinoids can be. How can this be possible? To the marijuana plant, cannabinoids function like an external immune system. They’re chemicals that help protect the plant from disease and other environmental factors that might harm them. So, it really makes quite a lot of sense that these compounds could be quite useful in killing bacteria in humans and animals as well. A marijuana topical is a weed-infused cream, balm, or lotion. Not only are they great for relieving pain, but their antibiotic properties also make them powerful natural remedies for minor skin abrasions and irritations. Researcher Appendino agrees that non-psychoactive marijuana topicals have a valuable medical use. “The most practical application of cannabinoids would be as topical agents to treat ulcers and wounds in a hospital environment, decreasing the burden of antibiotics,” he tells Schultz. One Colorado-based company, Mary’s Medicinals, has gone beyond topicals by creating a transdermal patch. While patches that include activated THC may still be psychoactive, Mary’s Medicinals sells CBD and CBN transdermal patches as well. These two compounds have antibiotic properties. Opting for cannabis-based cosmetics over conventional antibiotic containing makeup and cleansers is one way to ease away from antibiotic overuse. As research suggests, the cannabis plant may provide a more human-friendly alternative. Using natural bacteria-fighting cannabinoids may reduce instances of disease and helps us all live better as a species. Do you use cannabis topicals? Have you had any experience with using weed as an antibiotic? Share your experience with us on social media! Or, if you prefer, write us a note in the comments section below. We’d love to hear your opinion!